Shaanxi Cuisine, also known as Qin Cuisine, is represented by Guanzhong, south Shaanxi and north Shaanxi cuisine styles. Shaanxi Province occupies an important position in the development history of Chinese culture. Its cooking techniques can be traced back to Yangshao Culture period. In the Han and Tang dynasties, Shaanxi's cooking techniques reached a splendid period. Thanks to its unique position in the Chinese history, Shaanxi chefs gathered all eating and cooking advantages from all over the country, and formed its own characteristics. 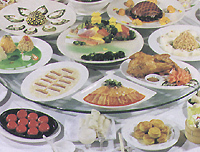 Famous dishes: Bottle Gourd Chicken, Mustard and Upper Part of a Pork Leg, Mushrooms, Walnuts Kernels and Two Kinds of Crisps, Three Kinds of Shreds, Guozi Fish in Milky Soup, Chicken Rice and Sea Cucumber, Tomato Juice and Ox Tongue, Steamed Mutton, etc. Created by Hanzhong City, Shaanxi Province, this dish has bright colors, an aromatic smell and a refreshing and delicious taste. 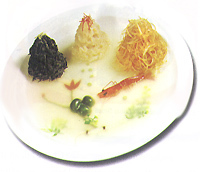 This dish was created by Van Culinary Research Institute in accordance with historical records. It features well selected ingredients, meticulous preparations, a crisp and tender and refreshing taste, just like a white lotus flower in a limpid pond, hence the name. This dish is a creation of Van, featuring delicious and tender fish, a strong fragrance of scorpions, a graceful smell of bamboo and a beautiful shape, with a role of dietotherapy. As a traditional dish of Van of Shaanxi Province, Guozi Fish in Milky Soup was evolves' from an imperial dish of the Tang Dynasty of more than 1,000 years ago. It features delicious and tender fish meat and milk-like and mellow soup. It is a nutritious dish rich in protein, minerals and vitamins. It is a famous traditional dish of Shaanxi Province, with a golden red color, crisp skin, tender meat, a strong smell and a mellow taste. As a famous classical dish of Shaanxi Province, this dish has red and white colors and a sweet and delicious taste. With a time-honored history, this traditional dish is full of fragrances of flower, wine, meat and vegetable. It is a famous dish of Hanzhong. Legend has it that when Liu Bang became King of Hanzhong, Prime Minister Xiao He, planted this cinnamon tree in person in Shengshui Temple in the south of Hangzhong, hence the name Han Cinnamon. This dish features tender and delicious chicken slices, with aroma of cinnamon, and a graceful color.